Four young trick-or-treaters set out on a door-to-door adventure. For those of you who follow the Raz's Midnight Macabre Facebook page you will be aware of how much I love Horror shorts. This Horror short is based on the short comic "The Last Halloween" by Mark Thibodeau, unfortunately I haven't had a chance to read it but I can still review the feature and I will most definitely be looking out for the comic. Brought to us by Director and writer Marc Roussel who also gave us the awesome "Remote" (review can be read HERE), this guy seriously needs to do a full feature Horror as he manages to capture an atmosphere so well and keep you intrigued. The films cast is fantastic but for me Ron Basch steals the show, he's Roussel's go to guy and there's no surprise as to why. Some Directors and actors just click such as Depp and Burton, DiCaprio and Scorsese, that's the type of relationship we have here. The short may only be ten minutes long but it doesn't waste a second and it's just screaming out to be made into a full length feature. You can sense an influence of John Carpenter in this and that's no bad thing at all. 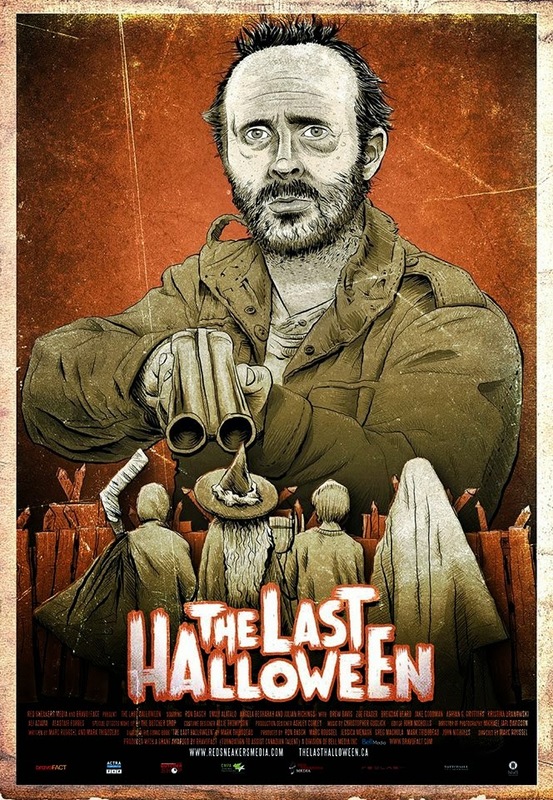 "The Last Halloween" is definitely a must see, if you get a chance to see it don't pass it up.